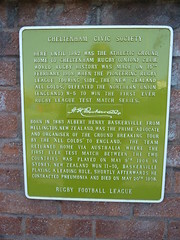 Here until 1982 was the Athletic Ground, home to Cheltenham Rugby (Union) Club. 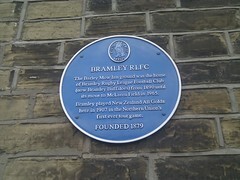 World rugby history was made on 15th February 1908 when the pioneering rugby league touring side, the New Zealand All Golds, defeated the Northern Union (England) 8-5 to win the first ever rugby league test match series. 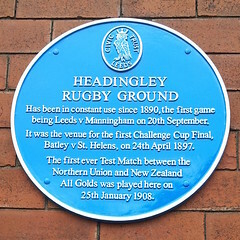 Born in 1883 Albert Henry Baskerville from Wellington, New Zealand, was the prime advocate and organiser of the ground breaking tour by the 'All Golds' to England. The team returned home via Australia where the first ever test match between the two countries was played on May 9th 1908 in Sydney. New Zealand won 11-10, Baskerville playing a leading role. Shortly afterwards he contracted pneumonia and died on May 20th 1908.